A lusciously soft fleece lined purple zip up hoodie, with a stunning distressed/ acid-washed vintage look. The mountain design on the back was inspired by Asheville and the blue ridge mountains, and printed with a 4 color glow in the dark fade under the artwork so that the sky and crystals light up electric green at night. Printed by hand in the blue ridge mountains using eco-friendly water based inks. About the fit // A stunning and sophisticated zip up hoodie and a must-have for all seasons, especially those music festivals that get a little chilly at night. The sleeves are extra long and the hood is deep. You will not want to take this amazingly soft hoodie off! 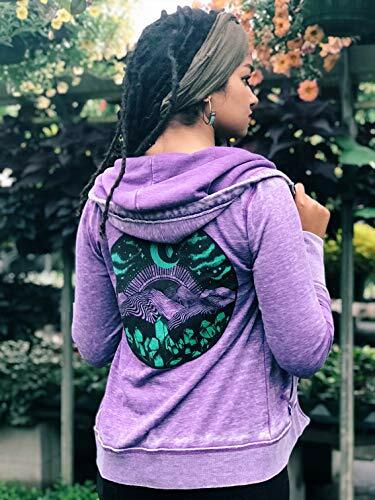 This style runs small -size up for a looser fit Model is wearing size medium About the fabric // This wonderfully soft hoodie is constructed with 50% Cotton 50% Polyester Burnout Fleece, and has been acid washed and single-died for a heathered vintage look. Due to the acid-washing process of which this hoodie is dyed, no two hoodies are identical. It has super soft fleece lining on the inside and features a cut-open neck detail, flat-lock stitching throughout, and extra long cuffs. If you have any questions about this product by Brain Candy Ink, contact us by completing and submitting the form below. If you are looking for a specif part number, please include it with your message.